I sometimes remind myself that I don’t know what I don’t know. Like an epiphany I realized the opposite is just as valid after visiting L’Escale Restaurant on Cap Brun. This corner of the Cote not only provides a rare respite from a Riviera crowded with glamorous yachts and visitors seeking a sneak into a world of the ritz and bronzed, it provides a glimpse into what the Riviera was like when cozy fishing villages first harkened British and northern European travelers to experience a warmer, simpler way of life. 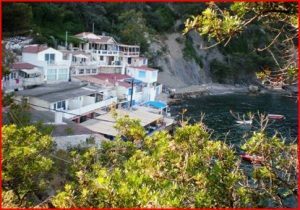 So, what I know I know is that if the past is any indication, the authentic charm of Cap Brun and L’Escale Restaurant won’t last forever. Sunset view from the terrace of the restaurant, looking east at Anse Mejan and the hamlet of the same name. The hamlet of Cap Brun at the base of the promontory of Fort Cap Brun. The awning in the foreground is the one sheltering the terrace of L’Escale. Nestled in the lee side of the mistral just outside the bay of Toulon and its rim of forts and redoutes, under the old fort of CapBrun and looking east at the Anse Mejan, a clutter of old fishermen houses accommodate a small restaurant, reminiscent of Renoir’s “Dejeuner des Canotiers”. Grilled fresh fish, Soupe de Poisson and its “rouille” (one of the Cote’s best, according to those in the know) are served foot steps away from the lapping blue waters of the bay. Sheltered from the mid-day sun by an awning of reeds and lit up at night by strings of simple light bulbs, L’Escale definitely is one of the best remaining “native” restaurants of this part of the world. 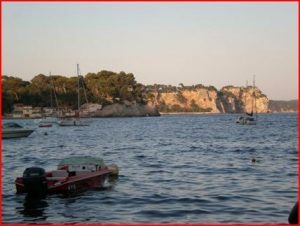 It is accessible by boat, by anchoring in the bay and going ashore at the small stone pier, or by car by following the signs for Mourillon, Cap Brun and the Sentier du Littoral, after a very narrow street. Parking is amply available on the top of the steps leading to the waters edge.